In our lowest points of life, God calls us to pray to Him. Desperate for refuge, David cried out to God: “There is no one who regards me; There is no escape for me; No one cares for my soul.” All alone—and with him, other desperate loners—David clings to God as the One who loves him and meets his every need. How can we respond to criticism that’s unfair and even abusive? When it happened to David, his friend suggested striking back. But David’s response was to place the critic in God’s hands, a model from which we may learn. David sang in Psalm 3: “But Thou, O Lord, are a shield about me…” As it turned out, God vindicated David through providential circumstances and condemned the critic through the same. Rough water. Cold and blustery. Hardly anyone there. Five bucks for night crawlers. Lines snag the weeds. Worm guts under my fingernails. A hook pierces my thumb. We fished the lake with worms, hooks, and bobbers while nearby a man cast his lure with a rod . . . and reeled in a nice bass. Hey, that’s just great. I looked up the term “lure” and discovered the word “tempt” in the definitions. 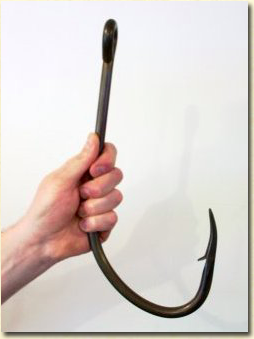 The probable origin of “lure” stemmed from the German, Luder, which means, “bait.” The connection between bait and temptation intrigued me. Later our family talked about it over dinner. The first time Satan cast his lure at humanity revealed his technique: “Indeed, has God said, ‘You shall not eat from any tree of the garden’?” (Genesis 3:1). Satan muddied the water by directly contradicting God’s Word. What’s more, he cast doubt on God’s goodness by suggesting the Lord was keeping them from their full potential: “You surely will not die! For God knows that in the day you eat from it your eyes will be opened, and you will be like God, knowing good and evil” (Genesis 3:4–5). With both God’s Word and God’s goodness in question, the woman had nothing to base her decision on except her own common sense. And she took the bait. Hook set. One of the lasting lessons of Eden is that even perfect people had the potential to make a stupid decision if they base it on their own wits apart from God’s Word. How much more vulnerable, then, are you to deception? God never created you to choose for yourself what is right for you. (The fact is, you don’t know what’s best for you.) He never intended you to determine what is right or wrong. Rather, He created you to choose to do what is right or wrong. When what was once a passion becomes a project, it’s time to look at motives. Why do you stay so busy? Is it all about your own fulfillment or about your love for Jesus Christ? How can we reignite our first love for God?